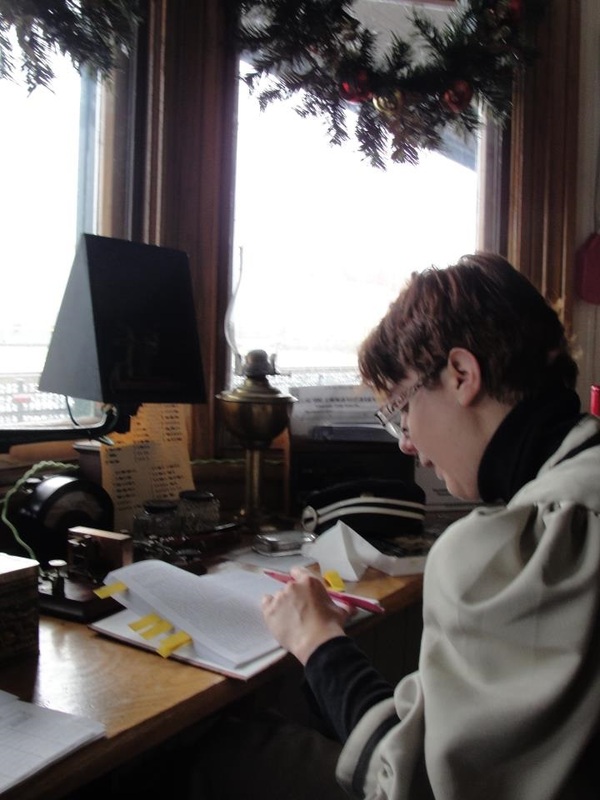 The author sits in period costume in front of her exhibit exploring the history of telegraphy and the contributions women made to the technology. In designing the exhibit, she drew on a diverse range of skills and hobbies to reach novel solutions. Diversity is a popular buzzword right now: diversity in staff, in teaching methods, and ideas. However, one aspect of diversity I have never heard mentioned is diversity in skillsets. It’s worth considering the hobbies employees (and potential employees) have, hobbies which at first glance might have no connection to their job description, but which in my experience have benefited our museum time after time and can be a benefit to other museums too. For several years I worked as an adult education instructor, and one of the lessons I taught was how to create a resume and look for a job. All the resume examples I found in our books included a special skills/hobbies section. This section would list skills like swimming, driving, or crafting. As academics and professionals, we don’t usually include such skills on our resumes unless a job posting specifically requests them. Even then, the only skill I have seen requested is that I can drive a car. As things stand, hobbies and side interests are not often a big factor in the hiring process for museums. If you are posting a job, you probably don’t ask about special skills or hobbies unrelated to the job requirements. You might not think it’s important that an exhibition designer is an amateur photographer, or that a collections manager is also an expert tailor. And if a prospective employee does list these skills, you might not pay attention to them, since you are only trying to find the person who best meets the requirements of the job you posted. Additional information might look like the person is trying to pad their resume. While you might not have hired for or sought to identify these skills in your employees, they’re still there anyway, and it’s up to you to find a way to use them. My own experience in a small museum has demonstrated that the greatest advantage a director can have is a staff with very diverse skillsets. This is especially true when the museum is trying to have a large impact on its community while operating with a small budget. To illustrate this, let me share a story with you. 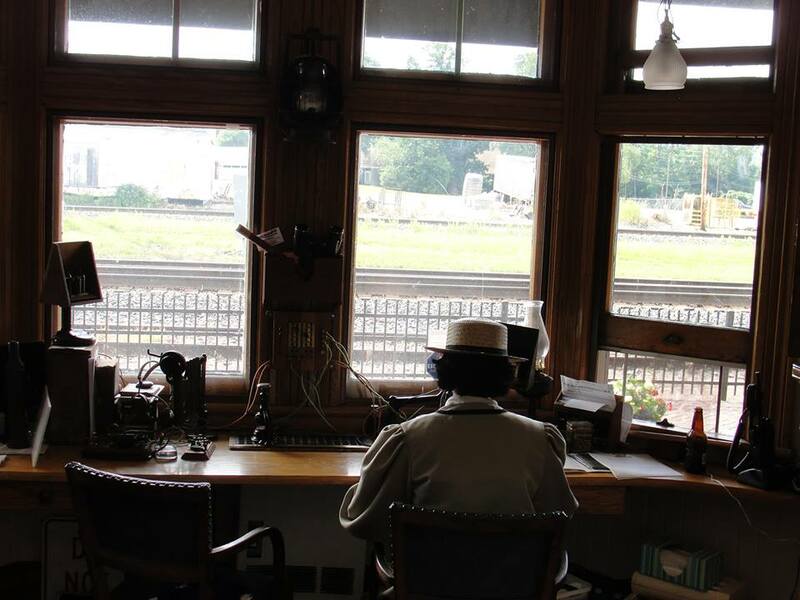 My mother and I have for several years run a living history exhibit demonstrating telegraphy at the Lake Shore Railway Historical Society Museum in North East, PA. We wanted to highlight the role women played in this early form of digital technology. I designed the exhibit, and she is the engineer, repairing and rebuilding equipment. As we repaired the equipment, we needed to develop our own solutions to certain problems, as some of the tools originally used in repairs were no longer available. To this end, I used some of what I had learned in a museum studies/archaeology course I took as an undergraduate student. I also used skills I had picked up as a fiber artist and crafter; I knit, crochet, sew, weave, and am learning quilting. These skills might not appear to apply to either a living history exhibit on telegraphy or my current occupation as curator of the museum, but it’s turned out that they do. I realized the benefit of these multiple skill sets, and the value of seeking them out, when I met someone who also worked with the same equipment. For several years we had been posting about our exhibit on a Facebook page, and we had been in contact with others who restored telegraph sets. One of these people was a telegrapher who had been part of the Railroad Museum of Pennsylvania in Strasburg, PA. The gentleman came to see our exhibit last summer and to meet us in person finally. He and his wife came to the Lake Shore Railway Museum, and we proudly showed off our equipment. Since we were working with technology that is over 140 years old, the discussion naturally turned to repair and maintenance. Telegraph sets are powered by electromagnets, which were made from several hundred feet of fine wire wound around a spool. He told my mother and me how he had used a vise and built a hand crank in his garage and spent hours hand-winding the spools. One problem was solved, but there were others. Another issue with electric equipment is accidentally grounding it, which will lose your charge. The wires for telegraph equipment were fed into a relay box; early on these boxes had rubber gaskets on them to stop the wires from touching the outside of the box and losing their charge. After over one hundred years the rubber had rotted away, and the gaskets that telegraphers used are not made any longer. Here again, a different set of skills came in handy. The gentleman talked about how he had tried everything to protect the wires; he had cut coffee straws into tiny pieces and used tweezers to put them into the holes, but they easily dislodged. He had stripped insulation of wires, cut it, and tried to put it in the holes, but he then could not feed his new wire through. My mother had to deal with the same issue, and here is where my experience in archaeology came in handy. I can see you smiling as you read this, and it is a funny story. It’s not only to amuse you, though, but to show how diverse skill sets are useful in many aspects of museum practice. This has been true at our museum not only with my skills but with those of our staff of volunteers. One of our volunteers, who has recently started college, has always loved making and editing movies. So, he became our unofficial videographer. He made videos of us moving the engines and cars, and rides on historical trains, and posted them to Facebook and YouTube. These videos helped to build our social media presence and draw more attention to the museum. Another volunteer works with a printing service and has used his connections to help design coffee mugs, patches, and decals, which we are now selling in our gift shop. Because he knew the design software, he could do the designing for free. And, since he worked at the shop, he could get us a discount and monitor how the production was coming. This saved our little museum a lot of money since we did not have to hire a designer and we knew that what we ordered would look good. It may not be realistic to expect applicants to change their resumes to include a skills section. In the hiring process, it continues to be standard to look for job-specific skills like Microsoft Word, Excel spreadsheets, and website design, not outside hobbies and interests. So instead, if we value these skills, we need to search out this information on our own. Perhaps at your next staff meeting, you might open the floor and ask people about their skills or hobbies. Then ask your curators, restorers, and PR departments if these skills can be utilized. An expert tailor who works in Human Resources might like to meet the curator in charge of a living history exhibit. A man who dug tunnels for the railroads or highways would probably have a lot of first-hand knowledge about the geology in the state. Next time you post a job opening, consider asking applicants for a sentence or two on skills or hobbies they have. An avid traveler might have connections in a country where your museum wants to begin an archaeological dig. A freelance writer could help with press releases, and a person who writes fiction might be helpful when creating an exhibition which uses storytelling. Of course, hire the best person for the job; don’t base your choice on what the person could do for a future project. And don’t think that one person’s skill set means they can do multiple jobs and you don’t have to hire as many staff. Instead, think of these as bonus skills that are likely to come in handy down the line. That being said, keep in mind that a person having these diverse skills does not only mean that they have something specific to add to your museum. It also suggests that they are open to learning new skills and expanding on the skills they have. It might mean that they can assist your experts without needing much additional training. And, they may be able to offer introductions to members of the community, including groups of artisans and local historians who you may not be aware of. Maybe such people might show their work or give demonstrations at the museum, or even offer classes to bring more people in. We all want to bring in the best people for our museums, but sometimes we don’t realize who the best people are and that they may already be on staff. Many people on staff may have valuable skills to contribute but are hidden in other departments or overlooked because of their position. Don’t let yourself get caught up in degrees and publication credits. People’s backgrounds give them skills you might not be aware of. Wake up and use them. About the author: I’m the curator for the Lake Shore Railway Historical Society Museum in North East, PA. I taught English and GED prep courses at the Erie Multicultural Community Resource Center. I’m an avid historian who has worked for seven years sharing the history of railroading in PA. I hold a doctorate in Philosophy and Religion with a special interest in the role of women in religion and changing cultures. I’m a contributor for a local alternative paper, have a WordPress blog, am a published poet, I contribute to Return to Mago E*Magazine, and write essays on social philosophy.